This group of adventurers are about to embark on a trip of a lifetime! They will be climbing Mt. 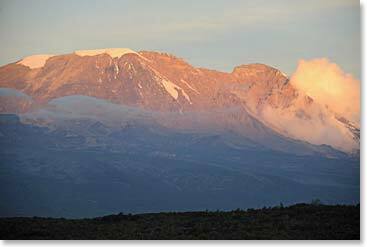 Kilimanjaro, the highest point in Africa and one of the Seven Summits. Come join the climb as our dispatches document their journey from the plains of Tanzania, through tropical rainforests and dry alpine deserts, to glacial artic conditions. The group will then embark on action-packed Safari days. This trip will offer the chance to explore Tarangire and Serengeti National Parks where Africa’s diverse wildlife will be enjoyed. For two team members the adventure doesn’t end there! They will fly to Rwanda to experience a gorilla safari in Parc National des Volcans, home to some of the last remaining 700 mountain gorillas in the world. September 12, 2012 – Party Time at Mweka Park Gates! September 10, 2012 – Congratulations to the Entire Team on Summit Success! September 10, 2012 – A Call from the Best Restaurant on the Top of Africa! September 9, 2012 – Jambo from Karanga Camp! September 5, 2012 – Ready to Do It!